ITI, Niranjanpur, Dehradun is conducting ITI Job Fair for all ITI certificate holders in its campus. All jobs vacancy in this ITI Job Fair are from reputed companies of Gurgaon and other places. So the place of job is to be Gurgaon. All candidates having ITI Certificate can participate in the Job Fair in Dehradun. Candidates should have passed ITI from following trades only – Fitter, Welder, Painter, Motor Mechanic, Diesel Mechanic COE, Automobile, Plastic Processing Operator, Turner, Machinist. Note : This Job Fair is not for Graduates, Diploma holders and women. All candidates have to participate in Written Exam on 28 June 2015 at 09:00 am. Selected candidates will be offer job in Industries. 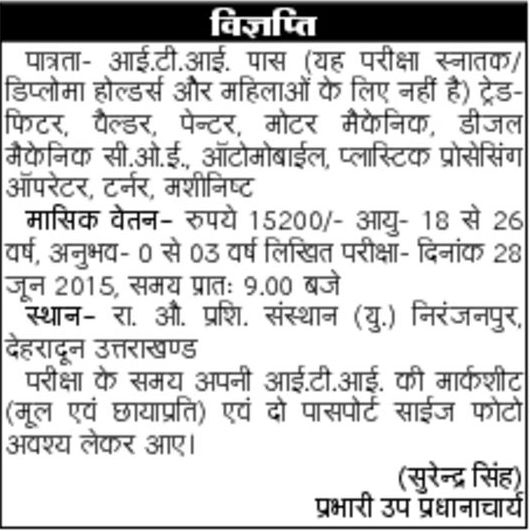 Help us to improve this article/job posting "ITI Job Fair in Dehradun on 28 June 2015". We would be glad if you can comment below and provide your valuable suggestions and feedback. If this page have any wrong information/list or out of context content, then you can report us as well. can SC candidate apply for this post? if yes, what would be the max. age limit ?? i am pass in government iti COE trade for injection moulding process. i.t.i ke form aa gaye hai. Mai 3 time niranjan pur aa ke pata kr chuka hu pr tb nahi aaye the mujhe bataya gaya tha ki abki form aane me thoda let ho gaye hai. please ye bata dijiye ki i.t.i ke form kb se milenge.piche saal bhi nahi bharna chahta tha pr miss ho gaya tha mujhse.please sir bata dijiye. Sir COE Electrician wale bhi apply kar sakte hai. Kab take admit card email ID Ma aaya ga sir giska exam 17July ko hai.